Kareem Abeed, Syrian producer of the Oscar-nominated documentary “Last Men in Aleppo,” will not be able to attend the Academy Awards because his visa application was rejected. The documentary looks at a volunteer group called The White Helmets that rescues victims buried in rubble following bombings in Aleppo during the Syrian civil war. Mahmoud Al-Hatter, a co-founder of The White Helmets who is featured in the movie, also cannot attend the Oscars because the Syrian government would not allow him to apply for a passport. Syrian film producer Kareem Abeed will not be allowed to attend the Academy Awards to support his movie, “Last Men in Aleppo,” as his visa application was officially denied by the US government. According to The Wrap, Abeed received word he was “found ineligible for a visa under Section 212(f) of the Immigration and Nationality Act.” Abeed’s rejection comes in the wake of President Trump’s travel ban, which puts restrictions on Syria, as well as North Korea, Iran, Chad, Libya, Venezuela, and Yemen. “Last Men in Aleppo” is a documentary that looks at volunteers of The White Helmets, the Syrian rescue team that saves victims buried in rubble following bombings in Aleppo during the Syrian civil war. 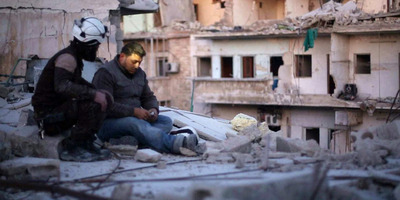 “Last Men in Aleppo” is the first film directed and produced by Syrians to earn an Oscar nomination. Abeed isn’t the only member of the movie’s team who will be missing out on Oscar night. The White Helmets co-founder, Mahmoud Al-Hatter, who is featured in the movie, was reportedly unable to apply for a Syrian passport to attend the Oscars as Syrian president Bashar al-Assad and his supporters have called The White Helmets a front for Al-Qaeda.